For my brother-in-law's birthday party, I was charged with baking something that would feed 30 people. Easier said than done! I didn't think you could cut a cake into that many slices without resorting to a boring sheet cake, and cookies wouldn't allow for the whole blow-out-the-candle thing. So at the last second I went with brownies. I chose this recipe on Food Network's website based on the rave reviews. Some suggested leaving out the coffee, but I thought that sounded like a delicious way to vary from the standard issue brownie. I wasn't disappointed! 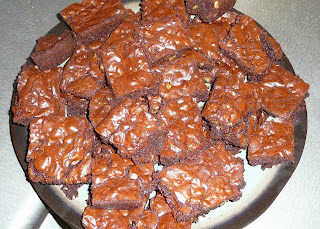 These brownies were oh so rich and delicious. I'm not a huge fan of nuts in brownies, but they worked here, and provided a good counterpoint to the otherwise densely rich chocolate. I accidentally left out 4 ozs of chocolate, but good lord, these have so much chocolate in them, that I cannot imagine why they'd need to be any more chocolaty! Someone else (dared!) to bring brownies to the party, and perhaps it was my rather aggressive cajoling that enticed people to prefer mine, but I'd like to think it was just the face that these were divine! The boyfriend and I literally turned the tupperware up over our faces to make sure we got every last crumb once the last brownie was gone a few days later.